Tropical cyclones frequently hit the Philippines with heavy impacts on infrastructure, agriculture and communities. A mechanism to assess damages and losses is crucial in informing decision-making and policy development. However, existing assessments only focus on infrastructure damages, neglecting the significance of other types of impacts on people, such as those related to physical and mental health, education and social capital. This research is an attempt to evaluate both economic and non- economic losses due to floods at the household level. 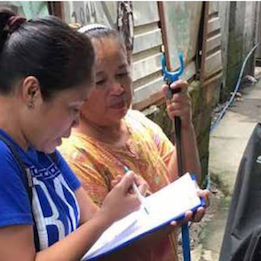 The main objective of this research is to understand and deconstruct both the economic and non-economic losses that urban poor households in Metro Manila incur from climate- related disasters. This study attempts to consider several dimensions, including social, economic, psychological, political, and environmental, in order to obtain an integrated and holistic damage estimation. A conceptual framework to measure loss and damage was built and used as a theoretical lens in the development of methodologies for assessing losses and damages. A survey of 300 respondents residing in flood-prone areas in the upstream, midstream, and downstream areas of Metro Manila shed light on economic losses. Three focus group discussions were conducted to collect data on non-economic losses and damages. Three components of risk – hazard, exposure, and vulnerability – were significant determinants of flood loss and damage. Gender, income and age were also significant predictors: considerable losses were incurred by households with more female members and lower income. The average income of the survey’s respondents is barely enough to pay for everyday expenses. Following major flooding events, many respondents said that they need to contract loans to recover from losses. The focus group discussion revealed the non-economic impacts. Even though none of the participants in the focus group lost a family member due to flooding, several of them experienced guilt, remorse, or trauma. The floods also had significant impact on the community’s social networks, children’s education, and local governance. The study highlights the complex nature of the interactions between economic and non-economic loss and damage, i.e. how they are not mutually exclusive but are related to one another. This research therefore contributes to the body of knowledge on loss and damage assessment, as it expands the current binary conceptualizations of loss and damage as separate and distinct when actually the relationships are quite fluid and dynamic. 3. addressing the communities’ mental and emotional well-being right after a disaster, to help affected populations cope with traumatic experiences. START International, Inc. is a registered 501(c)(3) non-profit organization. © 2019 START International, Inc.